This versatile half barrel table is perfect for any design décor. It's ideal for virtually any room in your home. 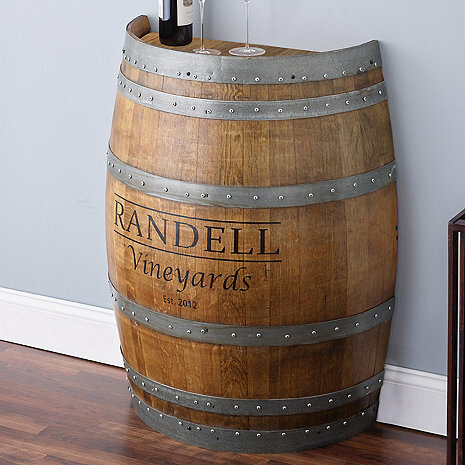 Personalize the front of this handmade, rich, reclaimed Napa Valley wine barrel to make it a guaranteed statement piece. Personalize with name and date. What is the weight of this piece? BEST ANSWER: Just weighed ours on a shipping scale and it came in at 50.4 pounds. The Reclaimed Half Barrel Table (Personalized) weighs 75 lbs. What does the back side look like? Could I see a pic? I see you can put a shelf in but could you also put a door on the front to access the shelf or shelves? Love it. It goes perfectly with our rack. Also purchased from you. My husbandâ? ?s only complaint was that it wasnâ? ?t full of wine. perfect addition to our wine wall. Just the right size. A must have for our wine room! The half wine barrel was a perfect finish to our wine room! Love it and everyone wants to know where we got it. Love it, tops off our wine room. We display it with a decanter and a bottle of wine on top. We are putting in an elaborate wine cellar in our home and this final touch made it perfect. Wish there was an option to have a cutout at the bottom to accomodate trim and allow the barrel to be more flush with the wall. The top planks separate too easily.